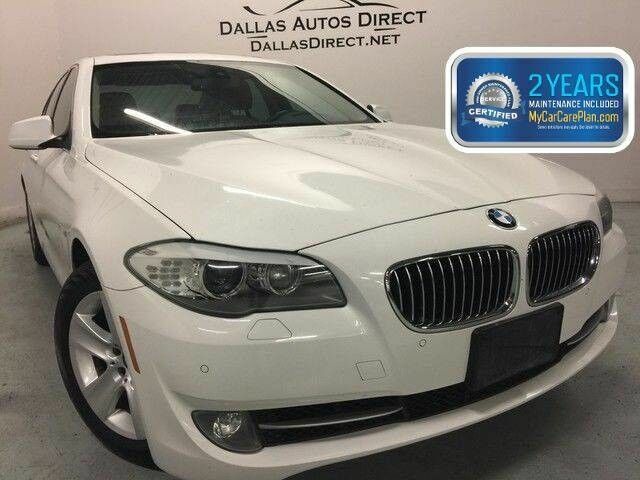 Contact Dallas Autos Direct today for information on dozens of vehicles like this 2012 BMW 5 Series 528i. When you purchase a vehicle with the CARFAX Buyback Guarantee, you're getting what you paid for. This BMW 5 Series has been loved by its original owner as CARFAX shows it to be a one-owner. Outstanding craftsmanship and artisanal refinements abound with this BMW 5 Series 528i. Why spend more money than you have to? This BMW 5 Series will help you keep the extra money you'd normally spend on gas. In addition to being well-cared for, this BMW 5 Series has very low mileage making it a rare find. The 2012 BMW 5 Series 528i is an especially rare vehicle. So rare that you've probably never experienced anything else like it. Where do you need to go today? Just punch it into the BMW 5 Series on-board navigation system and hit the road. Marked by excellent quality and features with unmistakable refined leather interior that added value and class to the BMW 5 Series This BMW 5 Series is beautiful and the interior is clean with virtually no flaws. Upgraded wheels enhance the look of this BMW 5 Series. More information about the 2012 BMW 5 Series: The 5-Series lineup of models offers athletic and surefooted sedans that also offer a surprising level of comfort inside. Technology is also a strong point in the 5-Series, with performance and safety standouts such as Active Steering, Active Roll Stabilization and a night vision system. The 5-series Grand Turismo Wagon is a very fashionable and fun-to-drive alternative to a sport-utility vehicle. This model sets itself apart with Athletic handling, impressive high-tech features, understated styling, powerful and refined engines, and superior ride quality Finance available with applicable fees.